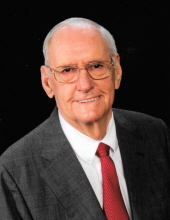 Celebrating the life of Milton Hugh Cashwell, Sr.
Obituary for Milton Hugh Cashwell, Sr.
Milton Hugh Cashwell, Sr., 83, of Americus died Monday, January 21, 2019, at his home. He was born November 16, 1935, in Early County to the late Hubert Clarence and Emma Mae Tyson Cashwell. He worked as a Conductor for CSX Railroad for 43 years. As a dedicated member of Central Baptist Church, he sang in the adult choir and the Silvertones choir and was a faithful member of Sunday school. He enjoyed playing the guitar and was a founding member of the King’s Heirs Gospel Quartet. He enjoyed gardening and woodworking and was a skilled brick mason. Most importantly, he was a good husband, father, and grandfather. Funeral services will be held at 11:00 a.m., Thursday, January 24, 2019, at Central Baptist Church in Americus with Dr. Bryan Myers officiating. Burial will follow in Oak Grove Cemetery. The family will receive friends beginning at 10:00 a.m., one hour prior to the service, at the church. Survivors include his wife of sixty-one years, Sue Abell Cashwell of Americus; four sons: Milton Hugh Cashwell, Jr., of Coleman, FL, William David Cashwell of Valley, AL, Joseph Andrew Cashwell and wife Danna of Moultrie, and Brian Douglas Cashwell of Dayton, OH. Also surviving are six grandchildren, five great-grandchildren, and a number of nieces and nephews. In addition to his parents, he was preceded in death by a sister, Geraldine Smith; and a brother, Clarence Cashwell. In lieu of flowers, the family suggests memorial contributions be made to the Central Baptist Church Benevolence Fund, c/o Central Baptist Church, 190 Upper River Rd., Americus, GA 31709 or to Phoebe-Sumter Hospice, P.O. Box 1434, Americus, GA 31709. Greg Hancock Funeral Chapel is in charge of funeral arragements. To send flowers or a remembrance gift to the family of Milton Hugh Cashwell, Sr., please visit our Tribute Store. "Email Address" would like to share the life celebration of Milton Hugh Cashwell, Sr.. Click on the "link" to go to share a favorite memory or leave a condolence message for the family.